After the excitement of Publication Day, I am into the world of promoting my book. How successful it has been is impossible to know. I try not to look at the graph on Amazon’s Author Central page too often. It’s a bit depressing as I have sunk from a peak of 39,496th out of the 6,000,000 books for sale, to 413,662nd today. The peak was 29th January, the day after publication, when all my friends and relatives bought it – thank you everyone! Apparently no-one has bought the Ebook version at all – yet. Monday was a normal day. As if nothing had happened, I was back to writing – although this time it was an article for a local history book that will be published soon. I have also been proof reading and formatting that. On Tuesday I was told by my publisher, that something I had written was published in a (online) magazine. I had been asked to write, “10 Tips For Turning A Historical Figure Into Historical Fiction”, only the week before. 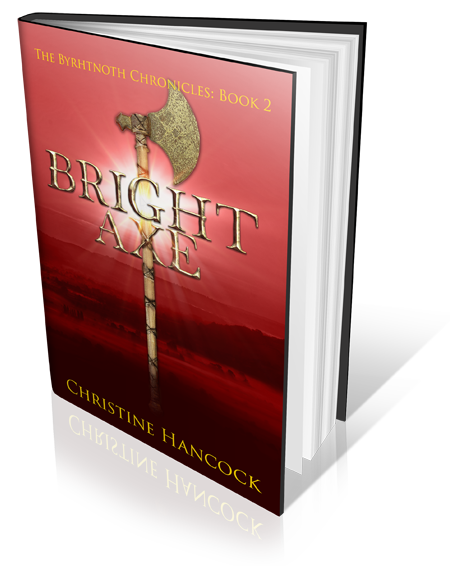 You can read it here, if you can find it among the adverts. I suppose it is the sort of thing writers have to do. Nothing much on Wednesday, but on Thursday it was the writing class. When one of us publishes a book we usually have cake. Someone had said that it was too soon after Christmas for cake (is there really a time when people don’t want cake? ), but I had already had another idea. 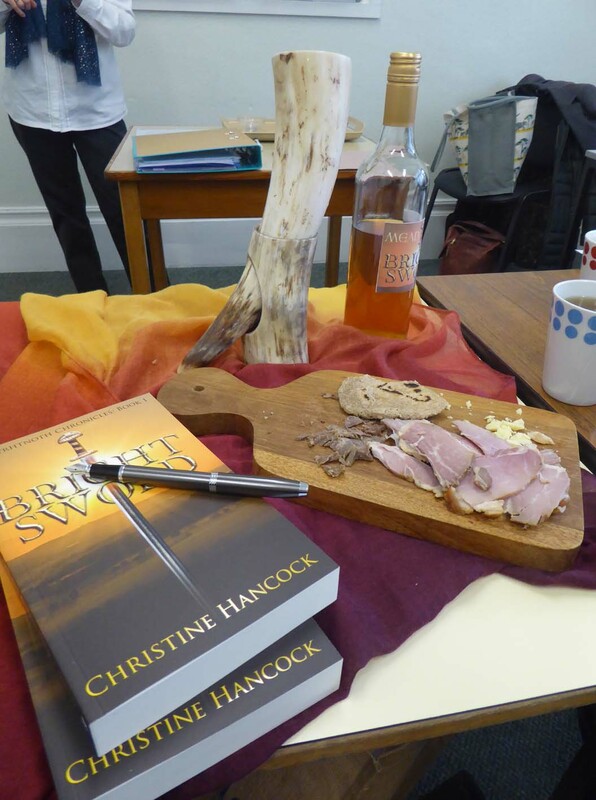 My book is about Anglo-Saxons, I have mead! So at the break I brought out my mead and my horn, plus small plastic tasting cups, because passing round a mead horn for everyone to drink from is not very hygienic. How those Anglo-Saxons survived without modern Health and Safety rules is beyond me. I also had food: salted meat (beef and ham – left over from Christmas), cheese and bread. I explained how there would not be much food left at this time of year, most animals would have been killed in the autumn and salted. The bread didn’t contain salt, because butter and cheese would also be heavily salted to preserve it. I used the recipe on this website. It tasted better than it looked! I also signed my first book (apart from those I’d done for family). There would have been others, but Amazon had not delivered! On Friday there was a meeting of Cafe Writers. I sold and signed another book – the first real money in my hand! The main event was planned for Saturday – the official book signing at the local bookshop. I had prepared. I got a piece published in the local newspaper – they got a detail wrong, but not about the book. I had put up posters, and talked about it on Facebook and Twitter. I mentioned it to everyone I knew, a lot said they would come. I had even ordered warriors from re-enactment group Ardenweard, a Dark Ages re-enactment group affiliated with The Vikings. I had one Anglo-Saxon and one Viking. I hoped they would have a fight, but apparently that’s against the rules. 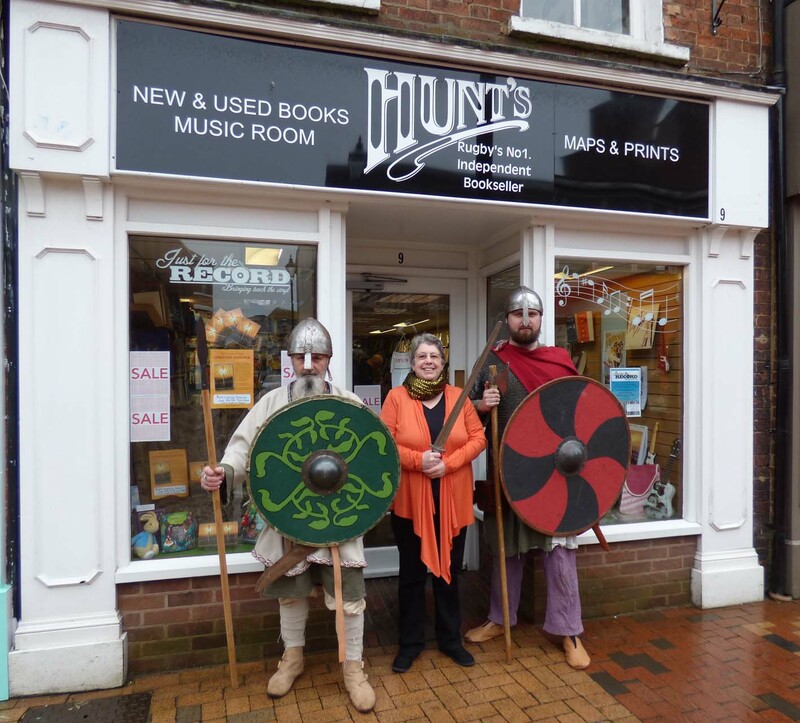 They were very friendly, talking to customers and offering samples of my mead – now officially approved by Anglo-Saxons, Vikings and the residents of Rugby. There was just one thing that I couldn’t control – the weather! It was cold and windy, with showers of sleety rain. Rugby High Street was practically deserted. My warriors did their best, standing outside until their feet froze. Apparently genuine Anglo-Saxon shoes are not very warm – not new ones, anyway. A few people turned up and bought books, which I signed, but not as many as I expected. 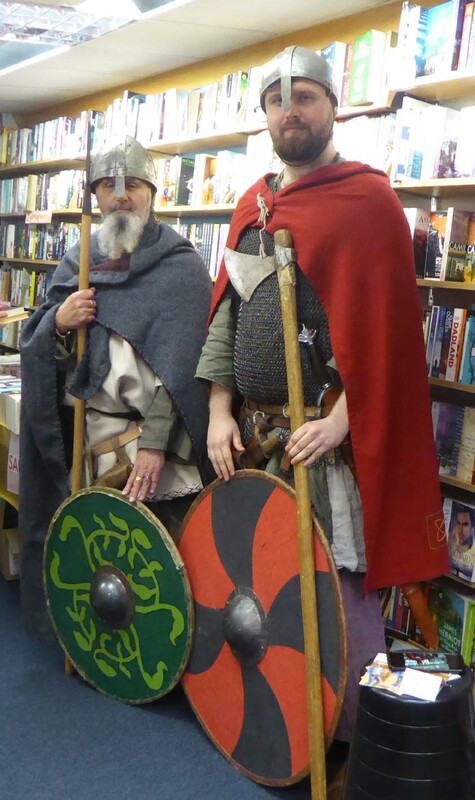 At least I had plenty of time to hold swords, try on helmets, and learn more about Anglo-Saxons (and Vikings). I will be attending another event next Saturday, a meeting of the Rugby Archaeology Society. There will be a talk by author Richard Denning about Life in Anglo-Saxon England. Copies of his books, as well as mine will be available. At least it will be indoors! No writing was done this week – well, not book-writing, but I have been thinking – more about that another time! My thanks to Ardenweard for the warriors. Memo: Remember to publish next book in summer. A few more inches and I’ll have that Viking’s head off!